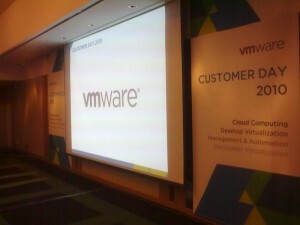 On Friday, September 10th, I attended VMWare Customer Day 2010 Korea, which was held at COEX Intercontinental Hotel, Seoul. Even though it has been a while past the event, I would like to share some notes worth sharing, combined with my personal thought about substantial content found in the talks I listened to during the event. As the event title suggests, the talks mostly covered introductory concept about cloud computing and virtualization as well as some promotional materials about VMWare products. This is coherent with the majority of the audience who came from the enterprises: IT staffs, ISV representatives, and company delegates. Three sessions were arranged for the whole event. The first session was a talk from Mike Sumner, the VMWare Asia Pacific SE Director. He talked about customer journey to IT as a service by riding the cloud and harnessing virtualization. Second talk about VMWare case studies was presented by Lee Mun-hyong, the Director of Channel and Alliance, VMWare Korea. The last session was delivered by Lee-Hyo, the head of VMWare Korea. He explained about vSphere 4.1 especially the new features in the release. The second and third session were presented in Korean so I only grabbed the general understanding and did not really grasp the details. In his presentation, Mike talked about cloud computing as an emerging trend in the enterprise. He also explained key drivers and phases toward its adoption in the enterprises and an era of IT as a service powered by the cloud. He started with listing several IT challenges in the enterprise environment. The challenges he mentioned include the necessity to deliver more business value, the ability to move faster and stay ahead of the competitors, the competency to maintain secure and compliant environment, and the capability of maintaining a stable system. Legacy IT business model relies on infrastructure ownership and dedicated IT force. With the introduction of the cloud in the enterprise, CIO may consider the transformation from a pay-in-advanced system into a cloud-based, pay-as-you-go system. Business agility is the ultimate reason for adopting cloud computing in the enterprise. At a final stage he named after “IT as a service”, enterprise will be capable of provisioning, managing, and delivering services that are dynamically driven by the policy. Prior to reaching this stage, however, two earlier stages that are cloud adoption in the IT production and business production should have been preceded. IT production, the first stage, involves the implementation of cloud technology by the IT department. In a common practice, this is translated as building the private cloud by virtualizing existing infrastructure and expanding the virtualization through the use of public cloud services. Some aspects may trigger the transformation from legacy system to virtual infrastructure-based cloud system. The aspects comprise common infrastructure problem such as costly hardware replacement, capacity constraints (power, cooling, CPU, space), and outages (power, application, system), as well as organizational challenges like merger, organizational change, and increased capability. Transforming the IT infrastructure into a cloud will bring extra capabilities such as massive consolidation, resource savings (space, cooling, hardware, energy), faster provisioning, and excess capacity for future growth. 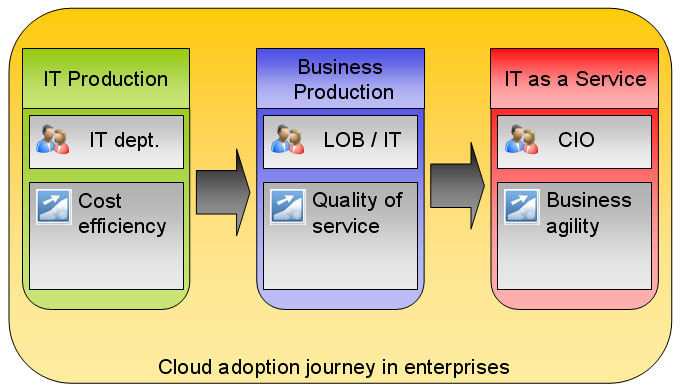 In summary, IT production stage in the cloud adoption journey produces cost efficiency in the company. Some obstacles may impede the success of IT production stage in the journey. The obstacles are mostly technical; centralized storage architecture that is incompatible with virtualization, lack of virtualization knowledge, and lack of team communication were listed by Mike. He emphasized that it was necessary to apply key best practices to overcome these obstacles. The best practices embrace continuous training, well-planned target architecture, organization-wide advocacy, and value tracking by reporting the outcome and added business value to the management. The second stage is business production. The goal of this stage is primarily running the business applications used by various lines of business (LOB) in the cloud formed on top of virtual infrastructure. IT department and LOB are the main sponsors or actors of this stage. They should be capable of addressing concerns raised by the stakeholders regarding the shift into a virtual business production. Concerns about SLA, ISV support, performance, and risk of running applications on virtual infrastructure should be duly taken care of in order to ensure that the virtual business production will only improve the overall quality of service. The notion of improvement in quality of service in a cloud environment is related with the capabilities produced by business production stage. These capabilities include quick compute resource relocation, quick service restoration, automated restart for higher availability, feasible disaster recovery solutions, application fault tolerance, reduction and simplification of remote IT infrastructure and reduction of investment in disaster recovery. To exemplify these capabilities in real-world test case, Mike provided a performance benchmark of an application running on both virtual and physical server. He showed how the application scaled better when running in a virtual environment compared to a physical server. Similar with the first stage, some barriers should also be tacked in order to ensure smooth transition to the next stage, the final stage named IT as a service. Mike stressed the importance of involving the CIO earlier in the adoption process since it will guarantee higher level of success and greater return of investment. 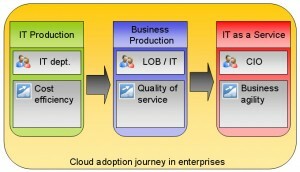 The representation of the cloud adoption journey paraphrased in the stories above is depicted in the following picture. I would be able to write more if the talk about vSphere 4.1 was delivered in English. So, this time I will just quickly summarize the product information I obtained during the talk while trying to avoid the sentiment of hidden advertisement. For the vSphere 4.1 release, VMWare provides four editions that are available for purchase: the standard edition, advanced edition, enterprise edition, and enterprise-plus edition. Several new features are introduced in the release. The first new feature is vMotion, which is the VMWare’s technology for live migration across datacenter. This feature is available in all the editions. The second new feature is vSPC (virtual Serial Port Concentrator), which are available in all editions except the standard one. The next new feature is Multipathing, an enhanced feature for live migration. This feature and vAAI (vStorage API for Array Integration) are available in the enterprise and enterprise-plus edition. Anyway, what incited my curiousity was vCloud director, the cloud management solution offered by VMWare. The vCloud director is responsible for orchestrating virtual resources managed by vSphere and scaling out to public cloud by utilizing VMWare vCloud API. I wonder if it supports integration with public cloud running different hypervisors (e.g. Xen, KVM). I hope I will answer this question in the near future. This entry was posted in Application Design, Operating Systems, Technical Notes and tagged cloud computing on September 30, 2010 by Tech Admin.